I am both honored and flattered to be asked to write a guest post for my Niece and God Daughter, Aimee. I'm also terrified because a lot of what I have hidden from our family for so long will now become public. And that would be how I really felt; how I was NOT coping. I basically just went onto auto pilot for so many years that a lot of what happened to Aimee and my family is blurred and unclear. I live and work abroad and have done for 28 years, I remember the day Aimee was born like yesterday, and being asked to be her God Mother was just the happiest time in my life. I vowed at her Christening that I would look after her and guide her on the right path. I used to travel home to spend my holidays every year catching up with family and to see and spend time with my beautiful Niece. I liked to think that although I lived so far away we had a special bond. This continued throughout her childhood and through to her early teens. It was when Aimee was in high school that I felt her beginning to pull away from me and to make myself feel better about it, I just put it down to the fact that like me, Aimee was fiercely independent and liked to try new things. She seemed to have a good group of friends and so I backed off from nagging her about writing letters etc, (no skype at that time). I can’t remember when I was first told about her harming herself, probably because I couldn’t accept the fact that she hadn’t confided in me or that I hadn’t noticed there was something wrong. I thought that I had failed to protect her and that she didn’t trust me to open up to. I didn’t even realize that my sister (Aimee's Mum) would also be asking herself the exact same things. As time went on, things were getting worse for Aimee and being so far away there was absolutely nothing I could do, it was the worst feeling ever. All I could do was get told about what was happening and hear about how my sister had to fight and navigate through all the red tape to get Aimee the help and support she needed, eventually Aimee was diagnosed with Borderline Personality Disorder. I remember getting a call once from my Mam and Dad (Aimee's grandparents), my Mam was in tears and she told me that they had been driving along a road and had witnessed a girl walking in the middle of the road between the cars. As they got closer they saw it was Aimee. My Mam and Dad got out of the car to help her but unfortunately Aimee could not recognize them and took fright and ran away. Luckily, help was at hand in the form of a man who caught Aimee and kept her safe until the Police and Ambulance were on the scene. I was not aware that when Patients have episodes they disassociate and are unable to recognize people. As hurtful as it is for the family and/or friends, I think it is also a protective mechanism for the patient, as the reactions of close family and friends to their loved one being in so much pain and distress may also be too hard for them to deal with. My sister had to learn this harsh truth quite early on with Aimee and tried so hard to educate me and the family, but I think with the age factor it was too hard for my parents to grasp. I, myself, could not understand and this was upsetting and frustrating for my sister that she couldn't help us to understand. When my Mam passed away and again being so far away, I didn’t get to say my goodbyes and still blame myself for not being there when my Mam needed me. At the same time Aimee was sectioned and was not able to get to the hospital in time either. I got a flight home and we all went together the next day. I was numb and kind of went into Auto pilot as was my sister. I just couldn’t imagine how Aimee was dealing with all of this. My sister had been with my Mam, once she was told that my Mam had been taken into hospital. She spent most of the time calling me and updating me on what was happening at the same time trying to get information from the Doctors, who couldn’t seem to tell us what the problem was. There was added difficulty in trying to keep in communication with the care professionals who were taking care of Aimee. Needless to say that this was such a horrific time for all of the family. I needed to stay in UK for some time after the funeral to help sort things out for my Dad. 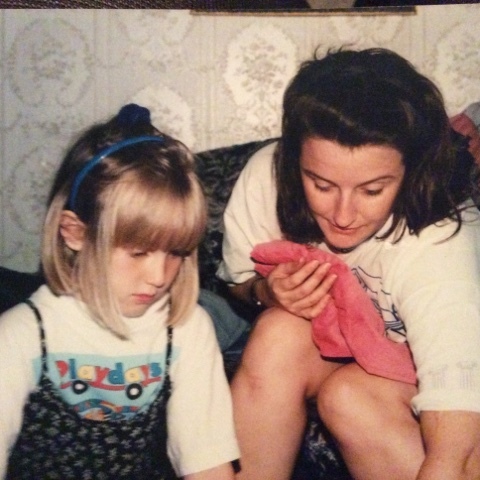 My sister had taken care of all the arrangements for my Mam; to this day I don’t know how she did everything she did as well as take care of all that was going on and happening with Aimee. At this point I was very scared to even talk to Aimee as I didn’t know what would trigger her so kept things as light as possible. We visited Aimee in the Hospital in the North and all I could think of was: She doesn’t belong here, how can this place help her and we as her family cannot. I didn’t understand it was about keeping her safe. Shortly after Aimee was released from her section, she took an overdose and went to the hospital but refused treatment, all the facts and sequence of events are very jumbled up but again it’s something that was so hard to deal with. I did my usual job of filing it away as I just didn’t know how to process the info and the fact that we could lose Aimee. My sister was at work in the same hospital Aimee was in at the time and asked me to come to the hospital and that they had put her in an induced coma to be able to treat her. My sister had a very heated discussion with a mental health professional who told her if Aimee woke up she would be discharged!!!! My sister wanted her sectioned for her safety. For my sister and I to have had to see Aimee lying there, hooked up to machines, lying lifeless, it was just too much. My sister had recently witnessed this during the time my Mam had been in hospital before she passed away. I don’t have the words to describe the look on my sisters face or the sheer terror in her eyes that this could be the last time we saw Aimee. I dont even know why I did what I did next but I am glad to say that I felt it helped in the long run. I took photos of Aimee as she lay in the coma. My thought process was that if she came round I would show her them and scare her into seeking proper help, whenever Aimee had overdosed in the past I felt that she was oblivious to the consequences of her actions. Luckily the coma was reversed and I did show the photos to Aimee, they seemed to have the desired effect in as much as they shocked her. She promised her Mam she would go into the long term facility that her mam had fought for. The facility was over 200 miles away as if my Sister and Niece did not have enough to worry about, being separated from each other and so far away just seemed to be the last straw and to be honest I didn’t think it would be conducive to Aimee’s recovery. Aimee has suffered so long with this illness and as I have come to learn it’s not an illness that has a specific cure and time frame. It will take as long as it takes and the person who is suffering is key to getting well. I am so proud of my Niece and I know that the last 9 years have been a constant fight for her to be able to believe in herself, to be able to look in a mirror and like the person she sees, to be able to take a compliment, and to be able to trust people, there are so many things she has worked on and so many things she has overcome. At the end of the day it was her who put herself on the road to recovery; all of the Doctors and Nurses only showed her the tools and the coping mechanisms to aid her recovery. Aimee is a very intelligent person and has not only used some of these tools to help herself but also to help others and not just patients. When she set up her blog: I’m NOT Disordered; it became my go to place to find out what was happening and for good solid information from the source. It helped me understand so much too, just as an example: I stopped blaming myself for not being there and noticing what was going on, I read as she explained in her blog how hard she worked to hide what was going on from family and friends. Aimee has recognized that there is a lack of awareness regarding Mental Health and has thrown herself into doing all that she can to rectify this. She volunteers endlessly and sometimes to the detriment of her own health. Over-tiredness and stress is a great enemy to someone with ill mental health. I’d like to end this on a positive note. Aimee is doing all she can to recover, Her mother fought, and still fights on her behalf on a daily basis. And the family? We revel in any achievements and or successes Aimee is recognized for. I am thankful that she chose to fight and continues to do so every day. To mental health patients and their families; recovery takes as long as it takes and it can feel like a day-to-day existence but there's light. And hope.